Combating the threat of antibiotic resistance has been the major focus of medical research recently due to the widespread of multidrug resistance and scarcity of newly introduced antimicrobials. This study aimed to investigate the effectiveness of Zn2+ and nano-curcumin in delaying antibiotic resistance development in Staphylococcus aureus. To do this, S. aureus ATCC®29213 was exposed to sub-inhibitory concentrations of flouroquinolones either ciproflocaxin, levofloxacin or ofloxacin in the presence of either Zn2+ or nano-curcumin. Minimal inhibitory concentrations (MICs) of each antibiotics were measured each day in 14 days of antibiotic exposure and expression of recA gene, an important gene in antimicrobial resistance development, was monitored using reverse transcription real-time quantitative PCR (RT-qPCR). Results showed that the addition of Zn2+ (400 μM) into fluoroquinolone antibiotics was helpful in reducing the rate and magnitude of antibiotic resistance development. Nano-curcumin (8 μg/mL), however, showed no significant effect on the resistance development process. Furthermore, in the presence of Zn2+ but not Nano-curcumin,, the expression of recA was repressed by up to 15-fold compared to the control. In summary, our study strongly supports the combination therapy, Zinc and antibiotics, for effective treatment of S. aureus infections. 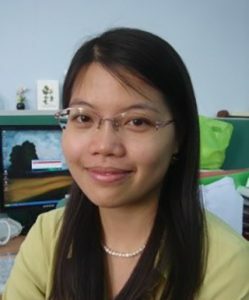 Hoai Nguyen has completed her PhD at the age of 27 from Greifswald University and postdoctoral studies from Catholic University of Louvain. She founded and leads Medical Microbiology group at International University since 2011. She has published more than 10 papers in reputed journals and more than 20 on others. She also serves as reviewer of many journals.